Any language compiled into byte code which is run on JVM can be used to write microservices for JLupin. The example of such a language is Groovy. It also supports using Java libraries inside Groovy's code, so it is easy to use JLupin Client library. 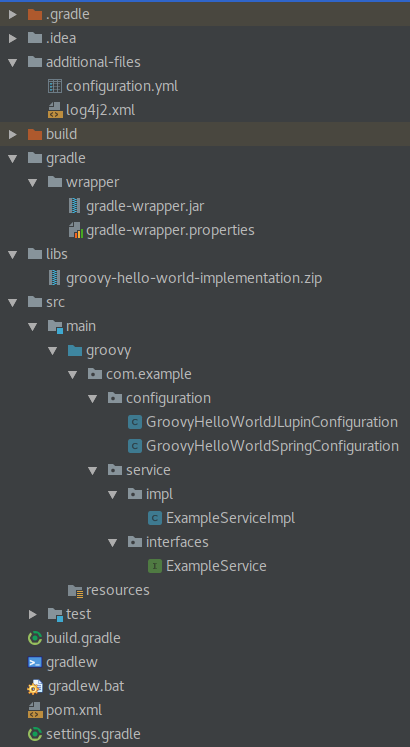 You can use libraries written in Java in your Groovy code, so you won't see any plain Java class. Spring-context and jlupin-client-assembly dependencies are set to scope compileOnly because they are available on server by default. Also one reslover is added with JLupin Maven repository address for getting jlupin-client-assembly library. Add two files with configuration: one for JLupin (GroovyHelloWorldJLupinConfiguration) and one for Spring container (GroovyHelloWorldSpringConfiguration). Create package com.example.configuration and put classed there. Microservice is done. You only need to add configuration for it. Create special directory for it called additional-files. Put in there two files: configuration.yml and log4j2.xml. To make it simpler to deploy out microservice add Maven definition pom.xml to use JLupin Platform Maven Plugin to create deployable zip file and to deploy created microservice (you can of cource do it without it, but then it requires more work from you). Enable shade and JCS JLupin Platform Maven Plugin for this module. They are configured in main project pom.xml file. You may noticed two things. First is that there is groovy-all dependency added. By default server does not contain it and it is certain that our microservice requires it to run - ended up it is written in scala. By adding it here it will be automatically added to our microservice zip. Also <finalName> and <directory> parameters are changed to match path where jar file is generated by Gradle. To deploy microservice make sure that you have started JLupin Platform and first compile your microservice to jar archive. It is done with command ./gradlew build. Then create microservice deployable zip file with command mvn jlupin-platform:zip@jlupin-zip and in the end deploy it to server with command mvn jlupin-platform:deploy@jlupin-deploy. All three steps should succeeded.